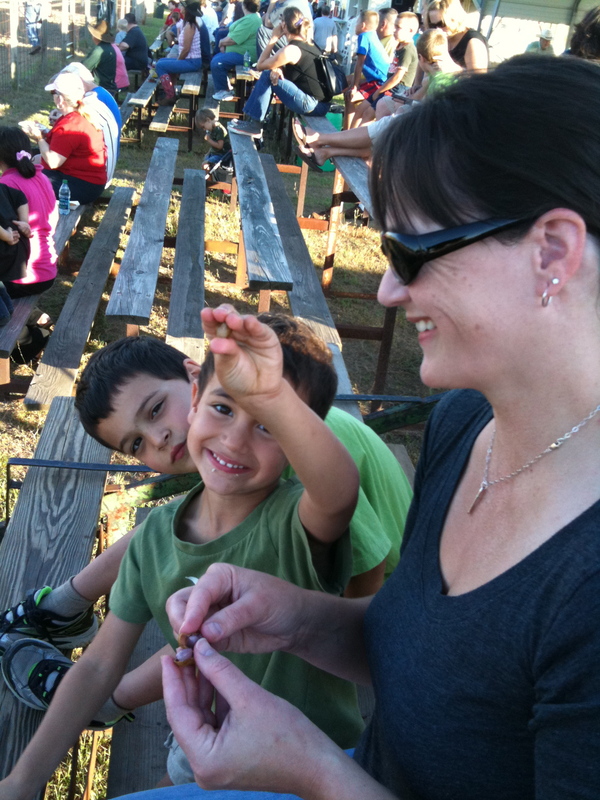 While Wills and Kate were enjoying a posh party with 300 of their closest friends, Eddie, the boys and I were on our way to the Vidalia Onion Festival, which included a rodeo. Jesus is in the market for a stuffed member of the Rat Pack? 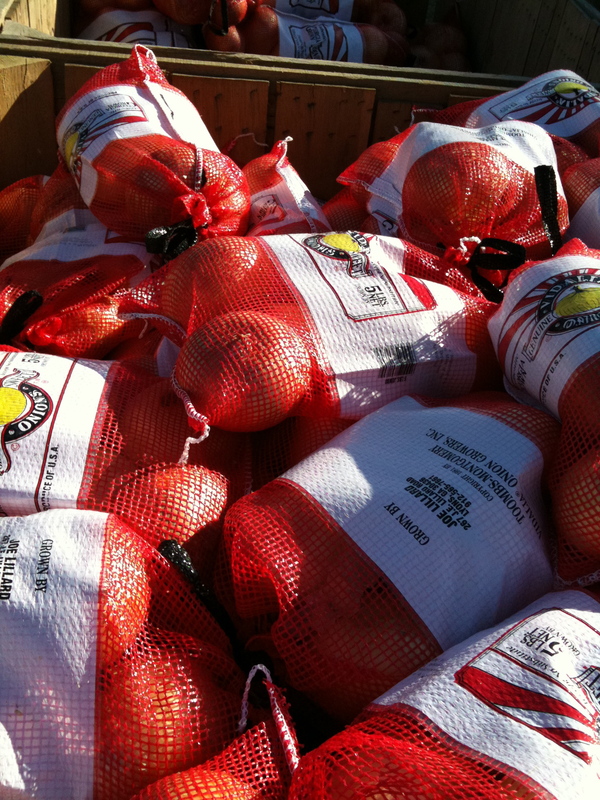 The city’s bounty comes in regular and jumbo sizes, and in five-, 10- or 25-pound bags. I chose a 10-pounder. The city's harvest dipped in batter and drowned in oil. Yum! Dominic is not so sure. 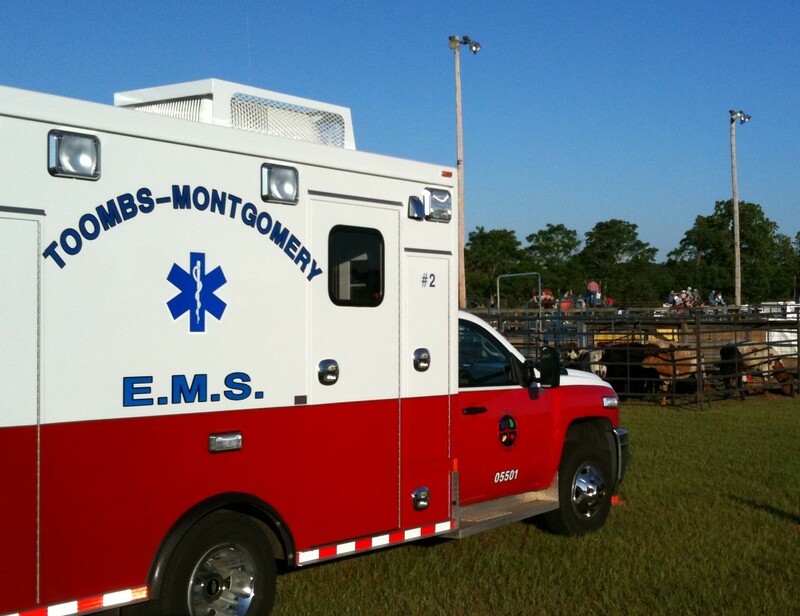 Paramedics at the rodeo. Is this a good thing or a bad thing? 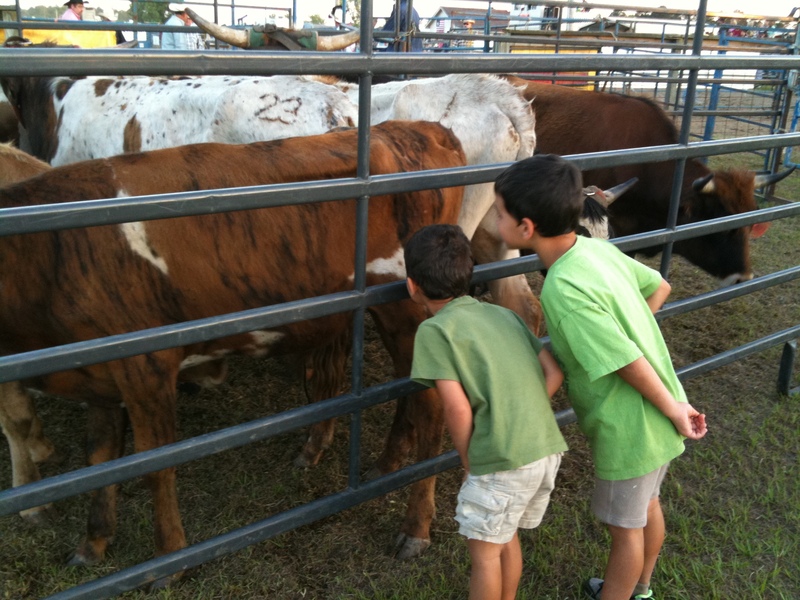 The boys enjoy an up-close-and-personal view of cow hide. 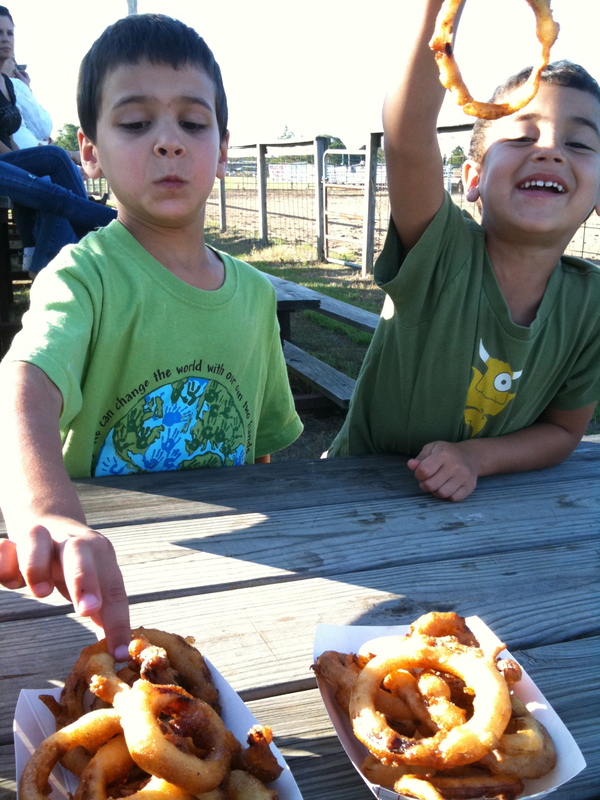 Nothing says "festival" quite like a funnel cake. 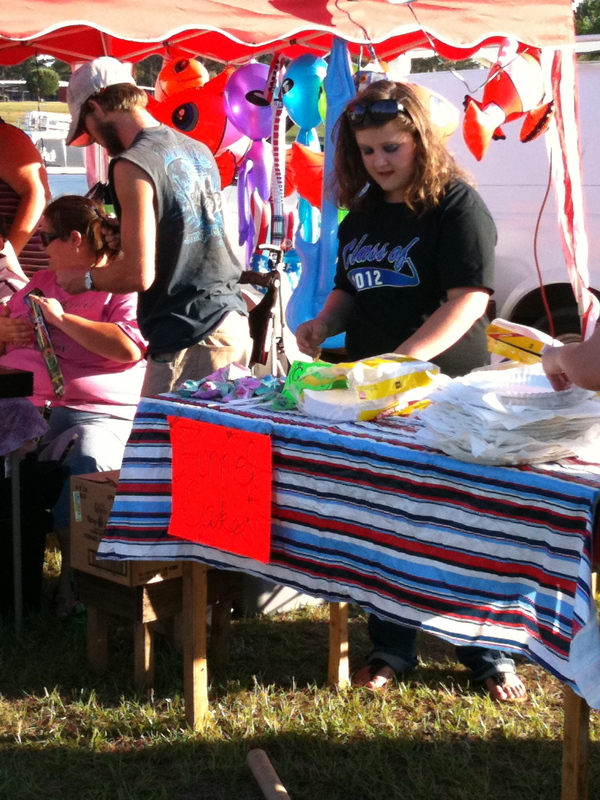 And nothing says "festival in the country" quite like boiled peanuts. Gideon likes them too! 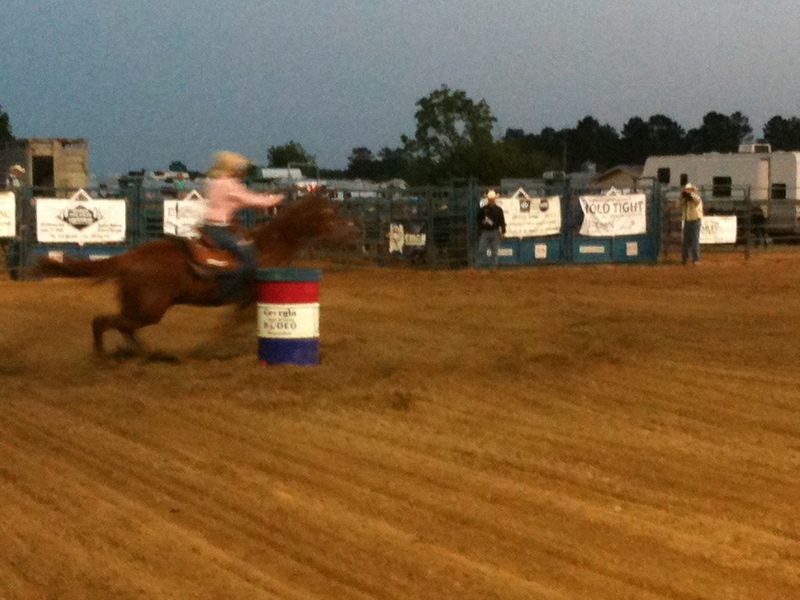 Ridin' and ropin' with a generous helping of Toby Keith and Garth Brooks over the loudspeaker. Where have all the cowgirls gone? Here, "cloverleafing" around barrels. 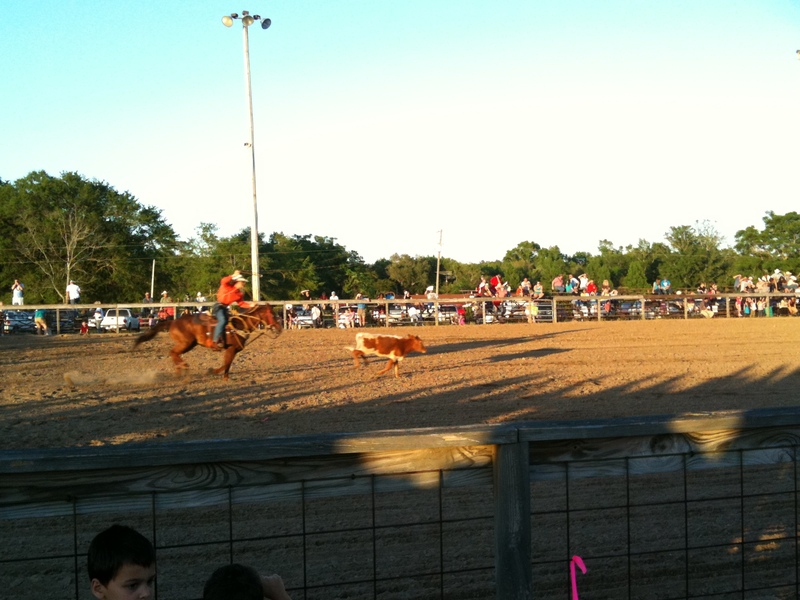 The rodeo was entertaining, even though the cowboys and cowgirls were high school students and not professionals. We need parents to help out with the goats, please. That’s not something I’ll bet Wills and Kate heard at their soirée. Just this morning, one of my coworkers was lamenting the “age of entitlement” and mourning the death of professor respect. I’m not sure I’m in a position to really complain about narcissism, though. My activity on Facebook, Twitter and this blog is not exactly bucking the trend. Narcissists believe they are better than others, lack emotionally warm and caring relationships, constantly seek attention, and treasure material wealth and physical appearance. So I’ll narcissistically comment on my narcissism in my narcissistic blog: One out of the four is definitely true, and I think someone could make a case for two others, although only in specific areas. Guess what that led to. 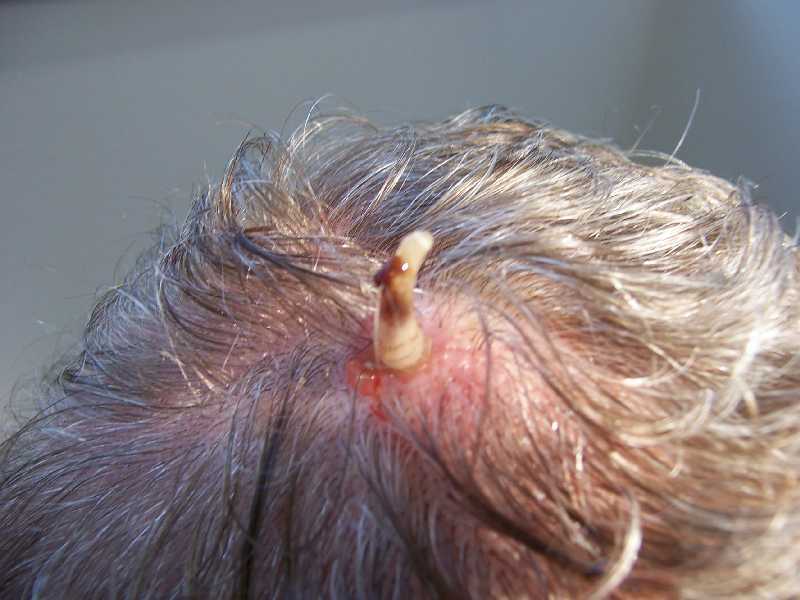 Warning: Do not watch if you have a weak stomach. … you have a portalet on the back of your pickup. 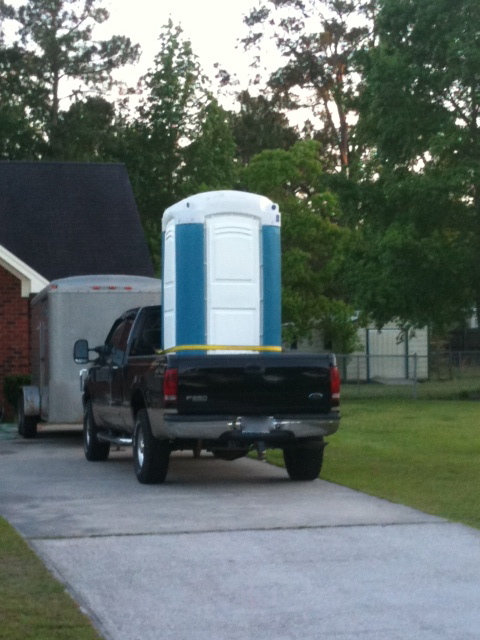 My neighbor might be a redneck. I’m not sure if I am becoming one, or am one already, but I certainly live next to some. She drives to the mailbox. You had to put up a taller fence to keep your neighbor from peeping over it to see what you were doing. She operates a beauty salon in her garage. There has been a refrigerator box in his yard for three months. Including the portalet, there are eight examples of redneckery afoot in my neighborhood. Yet I’m only talking about four different neighbors. 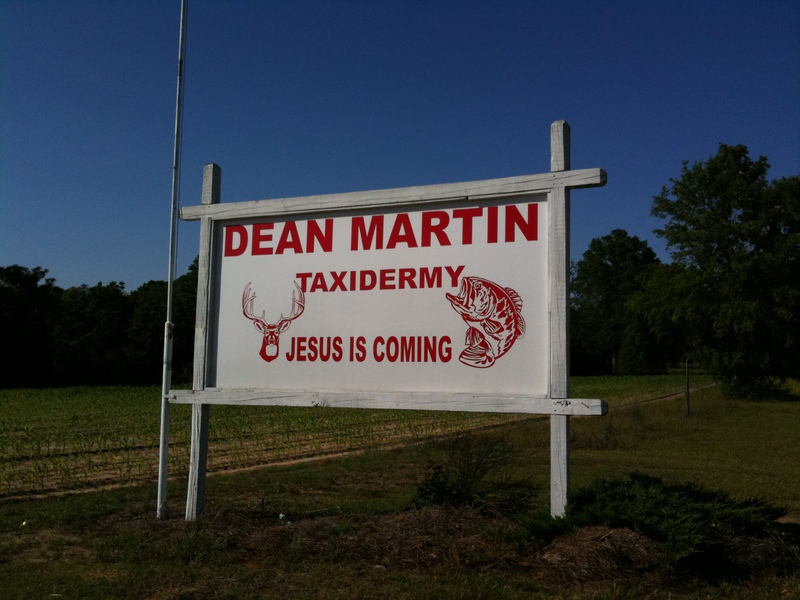 Redneck is as redneck does (apologies to Forrest Gump). Procrastination takes many forms. With me, it takes the form of a dive into the information vortex. Specifically, a vortex swirling with images of bed bug-infested mattresses, STD outbreaks, Meth Mouth and bad plastic surgery. Candiru, the “toothpick fish” attracted to urea. Guess where you find urea? Bad news for the fellas. The following image shows one just removed from a poor guy’s (ahem) parts. Cymothoa exigua, or the tongue-eating louse, which, unlike the above, is not a human parasite. This creature attacks fish by going in through the gills, attaching to the tongue, and extracting the blood so that the tongue atrophies. Then the parasite acts as the fish’s tongue. Shudder. Now I feel all gross and itchy, but I’ve succeeded in wasting plenty of time. Enjoy! Yeah. Um. Whose path am I going to follow? What other person has degrees in English, geosciences, performing arts and journalism? I think I’m on my own here. If I could follow a career path, though, please sign me up for J.K. Rowling’s. I’m OK with the whole living-on-welfare-until-book-sells stint. Or Oprah‘s. She’s kind of awesome. I have been learning how to say no. I’m not good at it. I’m overscheduled. I’m a Type A kind of gal. While my gut is lusting after Jackman as Wolverine, the rest of me is making to-do lists. It’s what I do. This one is easy. No offense to my former bosses (OK, offense definitely meant toward one of them), but I never had the desire to do the horizontal mambo with them. Never. Ew. Especially as many of them were women. (Wonderful women, but still.) I know many of the students in my department fantasize about my current boss because he is very cerebral, does yoga, gets acupuncture, and is very much in touch with his sensitive side. Fine. I can’t look at him that way. Ew, again. Uh oh. That was another list. Sorry again, Hugh! 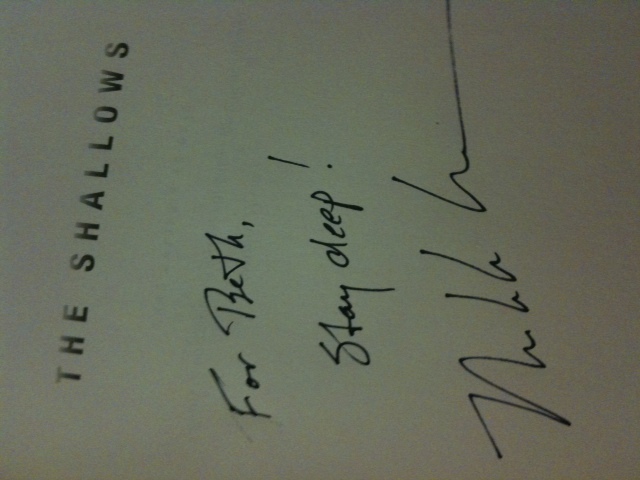 I attended a lecture last night by Nicholas Carr, author of “The Shallows: What the Internet Is Doing to Our Brains.” I was very interested in what he had to say because I have written about Carr before, and I have had his book on my shelf for nearly a year. Sadly, I’ve been too distracted to read it. And, sadly again, that’s his point. What he says is true: The constant barrage of information via smartphone, iPad, desktop computer, laptop, iTouch, etc., is eroding our ability to concentrate. We’re reverting to cavepeople distracted by all the sights and sounds of our environment, as opposed to the erudite focusers we became after Gutenberg invented the printing press. 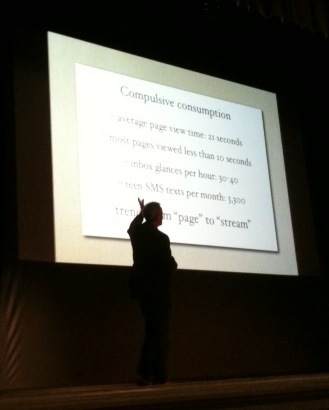 One of his slides gave me great pause. People claim they check email a couple of times per hour. Once research participants were fitted with eye-tracking paraphernalia, researchers discovered they checked email 30-40 times per hour. No wonder I’m not done with my dissertation yet. To his credit, Carr identified the many ways the Internet has improved our lives, including enhanced visual-spatial skills. And he admits to being distracted as well. Here’s the point I’ve made before: The Internet is not going away. So what do we do to maintain and improve our ability to focus? I’ll be looking for a nice WiFi-disabled cave to hang out in while I finish my dissertation.